Check out my cool Google Earth trail mapping site ShareMyTrail.com! You will find flyovers of nearly all the climbs listed here. Full N. Ridge Stuart - finally done! Mt. Goode: Loong, tiring epic, but classic alpine fun. Eisenhower Tower: better than it looks (esp. for the Rockies). The Ogre - not really that mean and crusty. The Tooth - deservedly popular. Really popular. Adams North Ridge - the better way on Adams! Mt. Hood north-side routes resurrected from the forgotten past (Ladd Glacier). Mt Constance, Tunnel Creek, Sept 17: man this is a long route! Mt. Stuart West Ridge, August 26, 2006: I finally get up this thing! Smith Rock, October 2004: some quick digital shots of a Smith weekend, including with Miriam on "Wherever They May Roam"
North Sister, July 2003: Failed but oh-so-fun attempt on the beautiful approach and climb on the N. Ridge. Yosemite weekend, May 2003: Crazy 5-day road trip! West Ridge of Forbidden Peak, August 10 2002: my first "50 classics" climb - happy birthday to me! Mt. Washington, North Ridge, September 2002 - I finally get up it! Ski tour, east face of Mt. Scott, May 2002 - huh? It's the high point in Crater Lake NP. 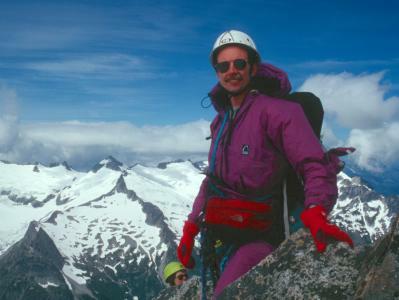 N. Ridge, South Sister (Silver Couloir variation), 1993 - my first hard lead - and Brian's great story. Note: Remove the _690 in the directory name to see much larger, higher resolution images, suitable for reprocessing. All contents Copyright (C) 1993-2008 Glenn Widener, except for material by other authors as noted.